AOptix Technologies, Inc. is taking the iris recognition biometrics market by storm with its proprietary adaptive optics (AO) system. The AO system is designed for iris image capture at stand-off distance of up to 2 meters. AO technology corrects for optical distortions caused by atmospheric disturbances and target motion and allows for real-time tracking and focus adjustments so the image is higher quality. Industry studies predict iris recognition market growth rates as high as 40% per year. Future applications for stand-off iris recognition could include aviation, military and border crossing security, ID programs, and access control. Campbell, CA — AOptix Technologies, Inc. a leading edge developer of advanced biometric iris recognition systems announced that it is entering the fast growing iris recognition biometrics market with its proprietary adaptive optics technology. The company premiered its fully functional 2 meter stand-off system at the Biometrics Consortium 2007 Conference. Adaptive optics (AO) correct for optical distortions caused by atmospheric disturbances and target motion. First applied in deep space astronomy imaging, AO systems measure wavefront error to optimize optical performance in real-time, and typically employ deformable mirrors in a closed-loop control configuration. In the company’s iris recognition architecture, AO technology allows for real-time tracking and focus adjustments, enabling iris image capture at unprecedented stand-off distances. The company has successfully captured high quality iris images at 18 meters, or about 60 feet, in controlled laboratory environments. For the shorter range, 2 meter cooperative system that will be exhibited at BCC, AO enables full automation of the subject acquisition and iris capture process, so that the subject merely needs to position himself in a very large volume of about 1 cubic meter, and look at the system. AO also provides consistently outstanding image quality, which the company believes will lead to significantly improved accuracy results. AOptix believes that the market for iris recognition will grow substantially over the next 5 years. Leading industry studies predict market growth rates of 40% per year (AAGR) for the iris recognition modality; the company also believes that its fully automated, stand-off technology has the potential to accelerate this growth. There are a large number of prospective applications for stand-off, cooperative iris recognition, such as aviation and border crossing security, national and regional ID programs, military base and governmental facility access control security, and commercial access control security. 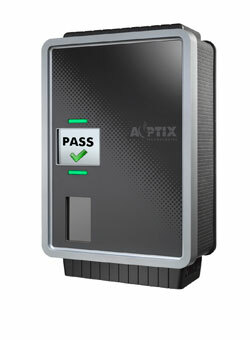 AOptix Technologies is a privately funded company founded in 2000. With core technology expertise in the application of advanced adaptive optics, they develop free space optical communications and biometrics based identification solutions for both government and commercial markets.